High☆Speed!, a somewhat overlooked movie in Kyoto Animation’s repertoire, is approaching its third anniversary. To celebrate that we’ll be hosting a series of interviews translated by Pen over the next few days, starting with this roundable where the core staff talked about their general feelings towards the movie as a whole and some key scenes in particular. Takemoto: At first I moved forward rather instinctively: “This kind of boy is great! He’s cute!“ We pursued the cast sincerely as the production began. Nishioka: It really felt as if we chased after them. I personally found Makoto’s portrayal to be troublesome, especially choosing the degree to which he would clash with Haruka. Takemoto: That’s right. We wanted to depict Haruka and Makoto’s interactions from the beginning until the scene where they swim together, as well as how they’d drifted apart, in a subtle manner. Nishioka: Settling on the right distance was difficult. Takemoto: Exactly. I constantly thought about how it’d appear to the viewers. Nishiya: I did everything very spontaneously instead. Takemoto: During the production phase, I was worried about various things. However, I eventually reached the conclusion that all I could do was giving my everything and put all the resources we had at hand to their best use to make this movie! In any case, we made delving into the cast the focus of this work, and dug deeply into the characters. Nishioka: I was reminded of that by the director many times. Takemoto: We received ideas and opinions from various people in the scenario meetings in search of the boys everyone would like to see. Nishioka: When you watch High☆Speed!, you get somewhat reminded of your own time as a student. I think there are quite a lot of people who feel a bit of nostalgia like this. Nishiya: I looked at the finished scenario and thought how naturally everything in the story connected to each other. Since I’d participated in Free! all along, I thought that if I made use of the feeling, or more like the impression I got from it, I should be fine. When I read the scenario for the first time, I internalized its contents quickly. Nishioka: Hearing that makes me glad. ―Do you have a favorite scene? Takemoto: I wouldn’t call it a favorite per se, but I put a lot of thought into the movie’s opening. Takemoto: I’d envisioned it very early on, and that’s is exactly how I wanted it to be. Well, although I had a clear idea to begin with, there were also aspects that still felt vague without color and music. But I once I looked at the whole picture, I was completely satisfied. Nishioka: There was one picture the director drew during a script meeting. 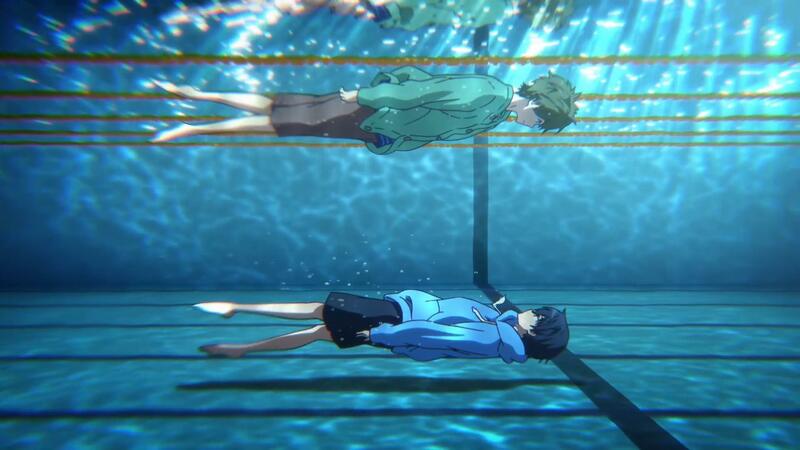 It showed Haruka leaning against the lane marks just before Makoto came. Even details like the steam that’s emitted from his body were meticulously illustrated. Looking at it, I was able to grasp that image distinctly. The finished scene was exactly like the drawing from that time, so I got really excited when I first saw it. Takemoto: I’d be glad if that scene stuck in the viewers’ memories too. ―Where did you get the idea from? Takemoto: It all began with series composer (Masahiro) Yokotani-san’s story draft. I found it very enjoyable at the time and that image popped up in my mind. So I’m quite grateful to Yokotani-san for inspiring that scene. Nishiya: Personally, the scene where Haruka and Makoto swim at the Iwatobi pool left a big impression. When I saw the storyboards and they were still wearing a t-shirt and cardigan, I thought “They are swimming with their clothes on! ?“ and got very surprised. Nishioka: It makes you wonder how they managed to swim just fine in that state. Takemoto: During the briefing with the unit directors, we discussed whether it’d be better to take off Makoto’s cardigan but in the finished version, he was still wearing it. It seems like there was a proposal to make him wear it after all. Nishioka: I see. When I saw the storyboards for that scene, I got excited. 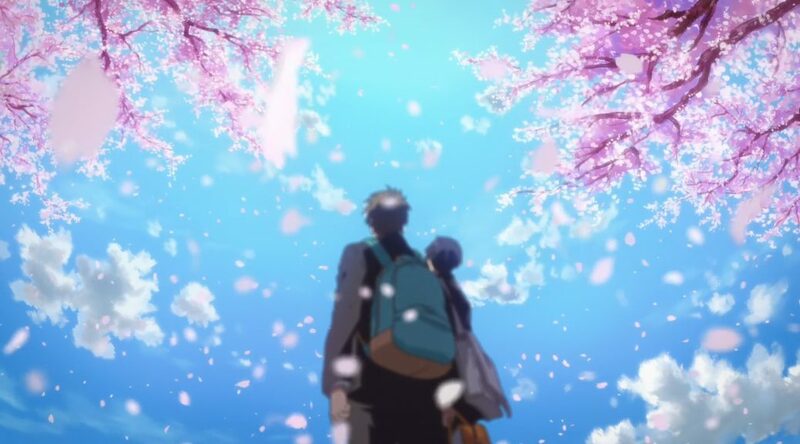 I wrote the script with the intent to bridge the gap between Haruka and Makoto after they’d drifted part, to bring them closer than ever before, but actually experiencing the visuals was striking. But since it’d become an even better scene than what I’d envisioned while writing, I also felt utter defeat. On the one hand, I was deeply moved because it turned into a wonderful scene but on the other hand – as the one in charge of the script – I felt somewhat frustrated. Takemoto: It’d been decided from the beginning that the first ones to recover would be Haruka and Makoto, and I constantly thought about the moment where those two would regain their footing. For a while, I couldn’t quite think of a plan that really clicked in my mind, so I brainstormed together with Nishioka-san even outside of the scenario meetings to develop the idea further. Keeping the emotional course of events in mind, I wanted to create a scene that appears natural. After a lot of thinking, we came up with the finished scene that now lets me confidently say “This is it!“. Nishioka: Anyway, I’m glad it turned into such a soothing scene. If I had to compare it to something, it has the same loveliness of two small fish playing around in a beautiful brook with clear water. Watching it cleanses your heart. Takemoto: That’s true, I’d hoped it would inspire that sort of image. I focused on what Haruka sees in Makoto, as well as the meaning behind their words. When I pondered about what kind of Makoto would appear calming to Haruka, I thought that his usual self who refers to him as Haru-chan would make Haruka come to terms with Makoto’s growth, how he’s starting to sound more mature and all the other trivial changes. Haruka’d realize that the existence known as Makoto had, at his core, not changed at all, and feel relieved. Nishioka: I think “feeling a distance“ is one of this work’s themes. Takemoto: Right, High☆Speed! is a tale of making comrades, of forming bonds. ―Following the TV series Free! and Free!-Eternal Summer-, were there any aspects you paid attention to? Takemoto: The plan was to stay cohesive regarding the TV series. I kept thinking that I wanted to create a work that people who’d seen Free! would feel glad they experienced. Nishioka: I think there were a lot of people who were worried whether the characters from the TV series would appear. As for me, I was strongly in favor of adding every character but the director made it clear that “every character’s appearance needs to have a purpose,“ which is why I was especially troubled by how we should incorporate Rei into the story. Takemoto: That’s because I wanted to value each boy individually, so I made sure not to let someone appear just for the sake of being there. Nishiya: Looking at it that way, it was a good thing we had the ending sequence. Takemoto: I was glad that we got to depict all the things that couldn’t make the cut for the movie itself. ―Was there anything in the source material that you wanted to portray in the movie? Takemoto: I found the characters very charming. That’s why I wanted to emphasize the vibe I got from Asahi and Ikuya in the light novel as much as possible in the scenario stage. It was thanks to the source material that we were able to create this movie, so I wanted to respect it as much as possible. Nishioka: I wanted to keep the parallels between Haruka and Ikuya that are present in the source material, so I integrated them. Takemoto: I also wanted to match it to Free!’s spirit, so I placed the focus on the process of how the boys become comrades, as well as how they interact and clash with each other, and developed the story from there on. Nishioka: Since every character had to be focused on in order to make Haruka & co. face the medley relay, it was a bit of a shame that we couldn’t add another boy in the movie. We thought that the other upperclassman character’s subplot that’s written in the source material would pose a slight hindrance for Natsuya. Takemoto: In this take on High☆Speed!, we wanted the upperclassmen characters to carry out the role of guides for Haruka & co. And so we decided to focus on Natsuya and Nao as well. ―When you rearranged the source material’s contents for the movie, where there any parts you paid particular attention to? 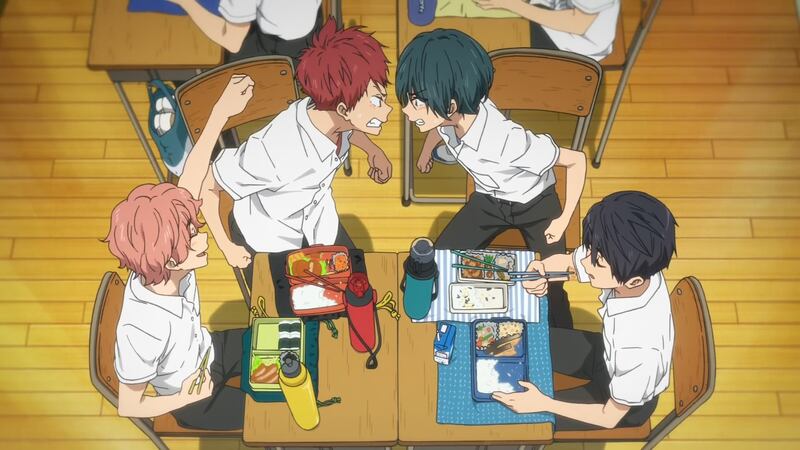 Nishioka: There was the consistent composition of Haruka, Makoto, Asahi, and Ikuya arguing with each other despite being together all the time. At first, everyone’s troubled by completely different things, so they are not quite facing the same goal yet. Takemoto: When we wrote the scenario we were troubled because we couldn’t bring the four of them together naturally. Nishioka: Indeed. Since I also see him in the role of the one who joined the four loose boys together, I’d like to give Kisumi a medal and the Distinguished Services Award. ―Which characters were easy to draw? Nishiya: I’ve been drawing them for a long period now, so the easiest ones to draw are Haruka and Makoto. Since they are middle schoolers this time, though, adjusting the proportions was tricky – not too young, not too mature; I searched for a subtle balance in-between. I also discussed with the director that their clothes shouldn’t be too childish either. Takemoto: Exactly. Kids nowadays are really fashionable and give off a smooth impression. Nishioka: Although their bodies are gradually approaching that of an adult’s, there’s still that innocence left in their voices that’s typical of middle schoolers; I think that’s really nice. This imbalance is very charming! Takemoto: Also, Natsuya and Ikuya’s brotherly bond was great. Nishiya: Can you see that they are related? Nishioka: If you look at their eyes up close, you realize that those two are brothers. Both of them have these feline eyes and such. Takemoto: While they share common traits, the contrast between such a soothing handsome guy and a slightly gloomy, delicate type is fantastic. Nishiya: Thank you very much. Nishioka: Giving siblings the same hair color is quite common in anime but that’s not the case this time. Nishiya: I wanted to give Ikuya a dark hair color. I think it fits his personality and aura more this way. But if you give Natsuya dark hair, his aura becomes a bit too heavy. It’d have been hard to bring out Natsuya’s cheerfulness, so I chose a different hair color for him. Nishiya: That’s right. Afterward, we tried out various things and in the end we settled on his current hair color. Nishioka: Natsuya’s current hair color makes his charisma easier to grasp, indeed. Nishiya: Initially, I drew him as a cheerful and hotblooded type, but then I dialed up the handsomeness. I decided to draw him as an attractive captain whose charisma overflows, and that’s how he turned into the current Natsuya. ―Was coming up with the character designs easy for you? Takemoto: Basically, everything went really smoothly. Nishiya: We already had the light novel’s designs this time, so we used them as the foundation. Takemoto: Precisely. I did request to make both of Ikuya’s eyes visible but other than that, there were not any big changes. Nishiya: The part I had to think over was the overall balance. I adjusted the characters’ appearances when they’re standing next to each other and so on. ―It seems like you were troubled by the school uniform’s dressing styles. Nishiya: It was quite difficult to make the right adjustments. I wanted to match everyone’s fashion sense with their character, so I was troubled by how should I diversify their styles; should I draw them with their shirts tucked in or not, that kind of thing. Nishioka: I think everyone’s individual personality comes out. It fits every single character’s nature. 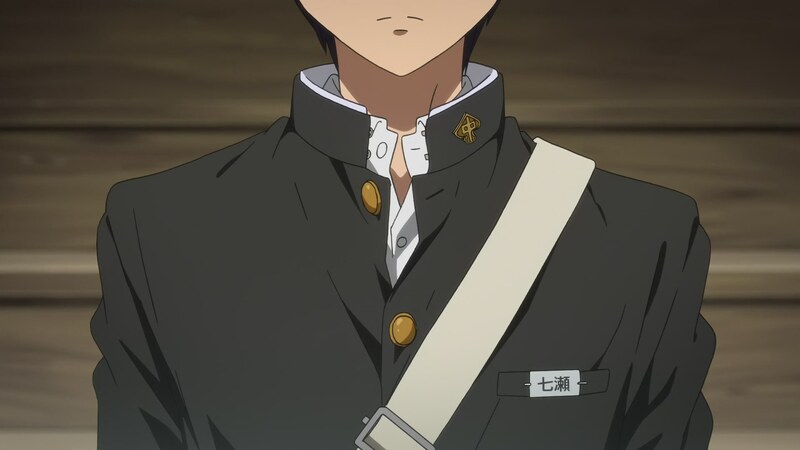 Nishiya: Speaking of which, you never see Natsuya in his summer uniform in the movie. Takemoto: That’s because there were many club activities and tournament scenes after everyone had switched to summer uniforms. ―What did you think of the recording? Please tell us about your impressions, anecdotes, etc, if you have any! Nishioka: I got the impression that the cast members had a lot of fun in the recording booth. Takemoto: Everyone’s voice acting was outstanding. It goes without saying for the regulars, but the newcomers nailed their characters as well. Personally, I’d like to give Kisumi the Excellent Performance Award. Nishioka: It’s amazing how he doesn’t get drowned out when being next to Asahi. 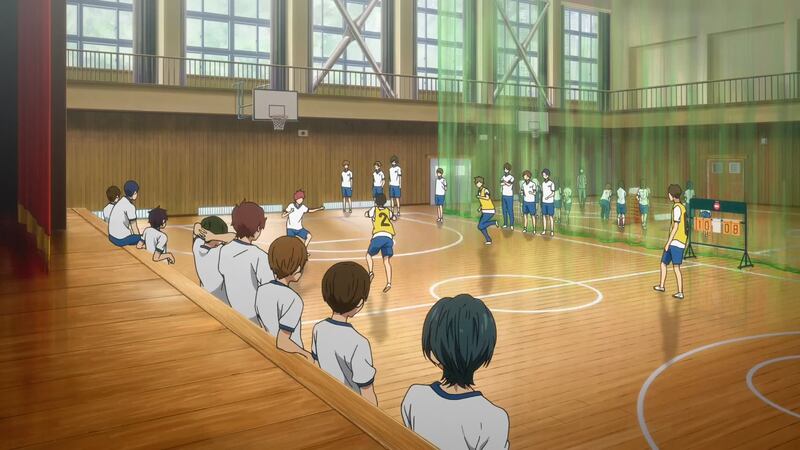 Kisumi’s role was to be a bit like the mediator for everyone. Takemoto: If Kisumi hadn’t been there, the scene in Haruka’s class might have turned out very unpleasant. Nishiya: Haruka and Makoto’s voices were really fantastic. They had this uncertainty that’s typical of middle schoolers. Also, the scene with a disheartened Asahi was truly impressive. The part with the line “What am I going to do if I can’t swim the other strokes anymore either?“ really touched me…! Nishioka: Just hearing it brings you close to crying. I actually got teary-eyed by reflex. There was despair oozing out from his voice, it was simply incredible. Nishiya: When I first heard Ikuya’s voice I found it quite mature. Or rather, elegant. ­Nishioka: Ikuya’s crying scene impressed me too. It was nice how he cried “Wah!“ like a small child. Once you become an adult, you somehow stop crying that way. ―Please leave a message for the readers! Nishioka: I believe this work’s highlight is how the four boys deepen their bonds while clashing with each other. I’d be happy if you felt even the slightest bit of sympathy for them and wanted to cheer them on. Nishiya: We carefully depicted how the four boys become a real team throughout this movie. I think it turned into a highly dense work filled with quite a lot of aspects to it. Please do watch it many times! Takemoto: I’d be glad if the viewers had at least one favorite scene, at least one character that they liked. If this work’s managed to satisfy you all, then I couldn’t be any happier.